The Education Department is revising contracts for student loan debt collectors. The Obama administration cut out private banks and lenders, which profited greatly from student loans, and put the federal government in charge of lending. However, the Education Department contracted out to private firms to service the debt, putting in place rules that would safeguard borrowers. The three memos DeVos tossed directed companies to reach out to people at greatest risk of defaulting and give them and all borrowers quality service, otherwise the companies would be financially penalized for poor service. Response time to answering calls, completing applications for repayment plans based on income, error-free communications and prompt processing of payments were all part of the government’s compensation for quality service. During DeVos’ confirmation hearing, which the Republicans rammed through amid unprecedented protest for a presidential Cabinet pick, the billionaire’s extensive financial holdings could not be completely vetted. But some red flags did appear, one of which was on student loans. One of DeVos’ businesses, RDV Corporation, which she had served as director of, was affiliated with another company that made loans to a debt collection agency that had business with the Education Department. College students and graduates are buried in student loan debt to the tune of $1.3 trillion, the second highest debt after mortgages, according to Forbes. Many of the Obama-era regulations tried to alleviate the burden, offering income-based repayment plans and loan forgiveness. 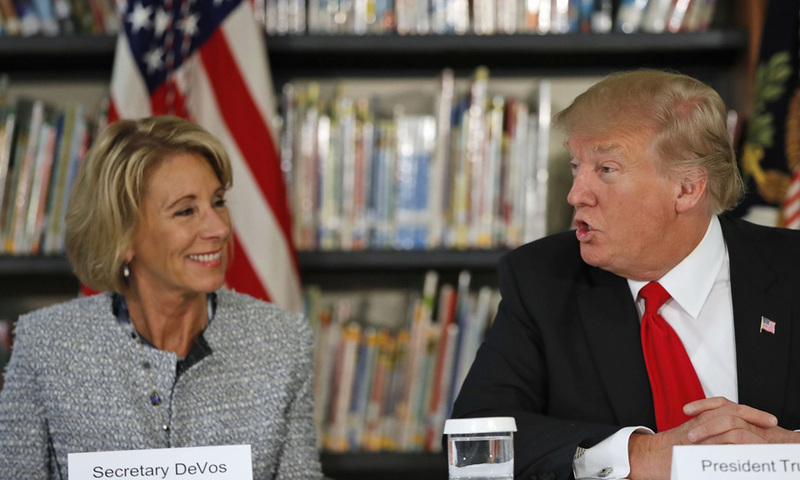 In an effort to show that support for public education transcends politics, American Federation of Teachers President Randi Weingarten invited DeVos to visit a public school in rock red rural Ohio. 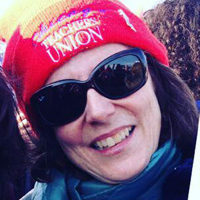 Weingarten had staunchly opposed DeVos’ nomination and the billionaire’s campaigns for school vouchers in Michigan. The union president most recently criticized Trump’s budget which cut $9 billion from Education Department programs designed to help poor students at the same time putting $1.4 billion toward “school choice,” a cause near and dear to DeVos. DeVos has been a frequent opponent to teachers and their unions, and a staunch supporter of “school choice” (vouchers), private, parochial and charter schools, all schemes that teachers and education advocates see as attempts to dismantle public education. Yet, on April 20, the two went to Van Wert, Ohio, a town of 11,000 that sits two hours northwest of Columbus, the state capital, to visit the public school district there.